Lauren Rosenfeld played sports her whole life; starting with soccer, swimming and basketball and then focusing on track and cross country in high school. While getting her business degree in Supply Chain Management at Penn State, Lauren tried a semester on the club boxing team, exposing her to a whole different type of workout. It wasn’t until college that Lauren started to actually learn about working out and realized fitness could be fun, not a chore! From doing strictly cardio, she took the plunge to stop being afraid of weights, equipment, squats (a now personal favorite!) and discovered HIIT workouts. No more hours and hours of cardio machines; getting out of her comfort zone proved to be more beneficial mentally and physically. As her passion for fitness grew, Lauren started working out with friends and loved getting them on board the fitness train. Sharing the benefits of fitness and a healthy lifestyle with others sparked the passion to be taken to the next level. Lauren recently passed her National Academy of Sports Medicine (NASM) exam and is now officially a certified trainer! Upon moving to Philadelphia she was exposed to the avid fitness scene throughout the city. 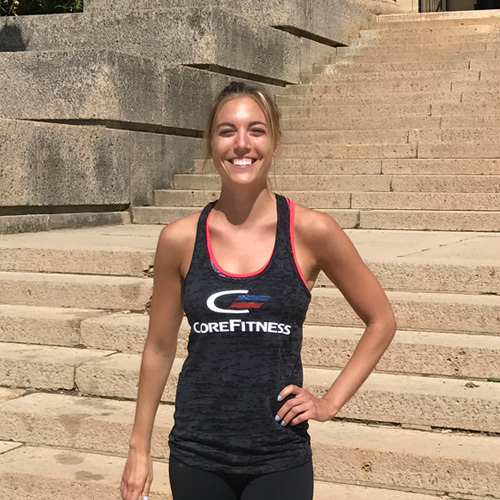 CoreFitness felt like the perfect fit and she cannot be more excited to be a member of the #corefitfam! Lauren’s workouts are intense and effective, but delivered with a smile and enthusiasm that will keep you motivated through out your entire workout! Check out her class, your legs will thank her!